Knack 2 review: "If it ain't broke, it's Knack(ered)"
They say that the last entry in any series anyone makes is the one that fails to make money. This means that, despite receiving a lot of lukewarm reviews – as well as some pretty scathing ones – the first Knack managed to find an audience. 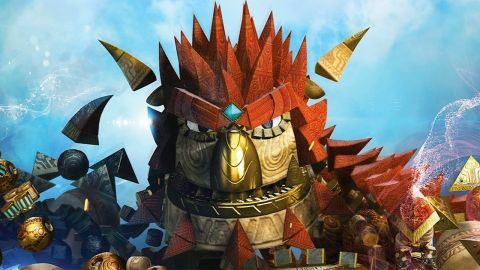 Once the receipts for Knack were counted and a sequel became a viable concern, it’s more than likely the developers had a choice: they could build on the rather flimsy foundations of their first game, or they could repeat the process wholesale in the hope that Knack’s core audience would return to them in droves. On the basis of Knack 2, they mainly plumped for the latter. Anyone who played the first Knack will be struck by how little there is in the way of genuine advancement in its sequel. Oh, there are some new attacks, some new collectibles, one or two instances where Knack sits behind the controls of some awesome machines and, of course, there’s a new story. But the basic experience of playing Knack 2 is pretty much the same as it was in the first game. If it ain’t broke, it’s Knack(ered). To wit, players should expect to enter numerous areas filled with an assortment of enemies. Once they’ve pounded them down (and they’ve disappeared), the area unlocks and they’re able to proceed. These fistfights are split up by platforming levels some of which contain their own set of puzzles. They provide something more to do beyond timing one’s jumps, but Mario veterans won’t find anything here too challenging. Besides, if players become stuck on a particular puzzle, the game helpfully provides a hint or two. So the lion’s share of the action is taken up with fighting and jumping. Knack’s signature mechanic makes a return, though the developers haven’t done much to make it feel fresh. If you're unfamiliar with it, a quick push of R1 allows Knack to shrink instantly, in order to evade danger or trundle through small passages, and then regrow to take on bad guys. Occasionally, Knack takes part in activities that you could call action set pieces, but these play out as a series of Quick Time Events (QTEs) and are largely unsatisfying. And it’s hard to recommend a game in which the most eye-popping action events involve the least input from the player. The story is brand spanking new, but it’s just un-engaging as the plot in the first game. It begins with Knack and his buddies Lucas and Ryder come across some old goblin ruins filled with dormant robots. In no time at all, they’re fending off attacks from goblins and the robots start mysteriously coming to life. After a brief conflab with Doc and an order of monks, the trio set out to find out what’s awakening the ancient goblin war machine. Hilarity ensues. There’s obviously more to the plot than that, but it’s pretty shallow stuff. Most of it plays out in cutscenes in which the dialogue is mainly perfunctory, containing none of the sparkle from Pixar films this game obviously wishes to ape. There are a couple of twists and turns, but they’re telegraphed pretty plainly. In short, the plot’s mainly a framework upon which to hang rather uninspired levels. There have been a couple of new tweaks and tucks here and there. The Sunstone mechanic has been changed; where once it was a series of attacks that could get the player out of hot water, now the yellow gems provide an extra level of armour. Knack has some nifty new fighting moves – thanks to one of the monks sharing her knowledge with him – including a couple of power punches and a ranged attack that snares foes. While these may have been introduced to mix up the combat, in practice, they become go-to moves for the player, as it’s all too tempting to spam them. There’s a series of talent tree players can fill out, divided between four separate categories. These unlock rather useful moves, such as turning a dash/dodge into an attack, or increasing the damage Knack does when he belly flops on some enemies. They’re fun to use, sure, but again, once players have found that one certain attack chain can pretty much dispatch any foes, they’re unlikely to use a lot of Knack’s newfound skills unless they’re absolutely committed to doing so. As was the case in the first game, players are encouraged to explore every inch of their environment for hidden rooms containing gadget parts and element cards, blue orbs for levelling up and Sunstones. Knack’s penchant with bonding with certain items has also returned; players can augment him with ice, metal and glass (for stealth) and these different ‘suits’ offer new ranges of attacks and abilities. Still, we’ve been here before. The game will take players roughly 14 or so hours to complete and once that’s done New Game + mode is unlocked – which allows players to replay their game keeping all the upgrades they earned in their first play through – and the Time and Coliseum challenges open up too. A co-op mode rounds out the package. Now, to be clear, Knack 2 – like its predecessor – is not a bad game. Indeed, depending on one’s age, expectations and experience, it can be quite a lot of family oriented fun. While the action is repetitive and the overall structure isn’t all that innovative, there’s something rather comfortingly retro about Knack. That having been said, Knack 2 is unlikely to attract any new converts, and with Destiny 2 and a couple of Lego games on the horizon, its success may just depend on the audience the original game won showing it the same love as its predecessor. Ultimately the game’s appeal boils down to one simple question: did you like the first Knack? If you did, then rejoice, because this is basically the same experience with a new plot and a few new features thrown in. Anyone who wasn’t already a fan of this franchise will find absolutely nothing to convince them to part with their money this time round.